The River Nile is a major north-flowing river in northeastern Africa, generally regarded as the longest river in the world. The length of the Nile River is approximately 6,850 kilometers (4,256 miles). The Nile is an international river as its water resources are shared by eleven countries, namely, Tanzania, Uganda, Rwanda, Burundi, Congo-Kinshasa, Kenya, Ethiopia, Eritrea, South Sudan, Sudan and Egypt. The drainage basin of the Nile encompasses about 10 percent of the area of Africa. The Nile River’s average discharge is about 300 million cubic meters (10.5 billion cubic feet) per day. A third river, the Atbara, flows into the Nile in the Sudan but it contributes less than 1% of the total water flow. 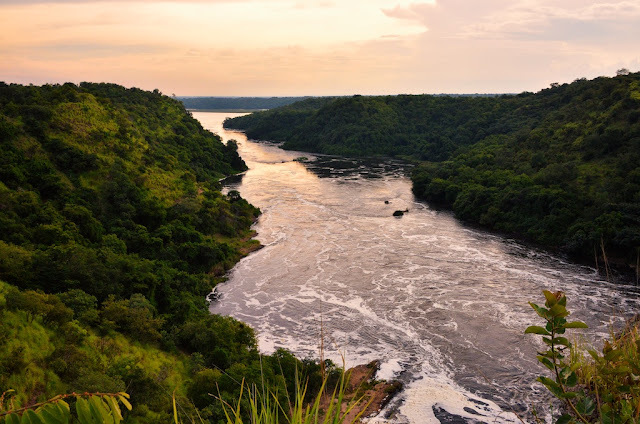 The White Nile is considered to be the headwaters and primary stream of the Nile itself.The White Nile is longer and rises in the Great Lakes region of central Africa, with the most distant source still undetermined but located in either Rwanda or Burundi. It flows north through Tanzania, Lake Victoria, Uganda and South Sudan. Today the Nile remains a vital pathway that is essential to millions of African farmers. Egypt still imports 40 percent of its grain by means of the Nile.The Blue Nile, however, is the source of most of the water and fertile soil.The Blue Nile begins at Lake Tana in Ethiopia and flows into Sudan from the southeast. The two rivers meet near the Sudanese capital of Khartoum. The northern section of the Nile flows north almost entirely through the Sudanese desert to Egypt, then ends in , a large delta and empties into the Mediterranean Sea. Near the Mediterranean Sea the river splits into two branches, the Rosetta Branch (to the west) and also the Damietta (to the east). And both of these rivers flow into the Mediterranean Sea. The Nile Delta is one of the world’s largest river deltas.It is around 160 kilometers (100 miles) in length and spreads out over 240 kilometers (149 miles) of coastline.It is rich in agriculture and has been farmed for thousands of years. Before stopped by dams the Nile would overflow every year.The Aswan High Dam was built in 1960. Other major dams are the Roseires Dam, Sennar Dam, Owen Falls Dam. The Nile has flooded seasonally over millennia to provide life-giving fertile soils and irrigation for Egypt’s people. The Nile River has certainly played a critical role in the history of ancient Egypt.Most of Ancient Egypt’s historical sites are located along the banks of the Nile River including cities such as Luxor and Cairo. Upper Egypt was known as Ta Shemau which means “the land of reeds” referring to the papyrus that grew on the banks of the river in great abundance. Papyrus was the symbol of Lower Egypt whilst the lotus flower was recognised as the symbol of Upper Egypt. Many varieties of fish are found in the Nile system. Notable among those found in the lower Nile system are the Nile perch (which may attain a weight of more than 80 kilograms (175 pounds)), the bolti, the barbel, several species of catfish, the elephant-snout fish, the tigerfish or water leopard, lungfish and eel. The Nile crocodile, found in most parts of the river is one of the largest crocodiles in the world. Other reptiles found in the Nile basin include the soft-shelled turtle, three species of monitor lizard, and some 30 species of snakes, of which more than half are venomous. The hippos, once common throughout the Nile system, is now found only in the Al-Sudd region and to the south. The name Nile is derived from the Greek Neilos (Latin: Nilus), which probably originated from the Semitic root naḥal, meaning a valley or a river valley and hence, by an extension of the meaning, a river. The ancient Egyptians called the river ‘Ar or Aur‘ meaning “Black,” in allusion to the color of the deposits carried by the river when it flooded. Hapi was the god of the annual flooding of the Nile in ancient Egyptian religion.Hapi was greatly celebrated among the Egyptians. The Greek historian Herodotus wrote that “Egypt was the gift of the Nile“. Lake Nasser is the second largest man-made lake in the world. Lake Nasser is where the waters of the Nile are held back by the Aswan High Dam.The lake produces 25,000 tons of fish a year. It’s only recent that the first known navigation team successfully followed the river from beginning to its end.